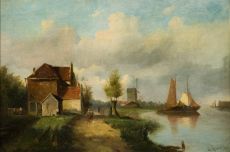 Charles Henri Joseph Leickert (22 September 1816, Brussels – 5 December 1907, Mainz) was a Belgian painter of Dutch landscapes. 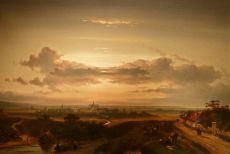 As a specialist in winter landscapes, he explored the nuances of the evening sky and the rosy-fingered dawn. 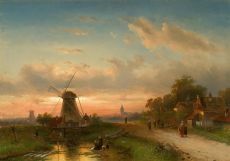 Charles Leickert first learned painting in The Hague under the supervision of landscape painters Bartholomeus van Hove, Wijnand Nuyen, and Andreas... Read moreCharles Henri Joseph Leickert (22 September 1816, Brussels – 5 December 1907, Mainz) was a Belgian painter of Dutch landscapes. As a specialist in winter landscapes, he explored the nuances of the evening sky and the rosy-fingered dawn. Charles Leickert first learned painting in The Hague under the supervision of landscape painters Bartholomeus van Hove, Wijnand Nuyen, and Andreas Schelfhout, among many others. 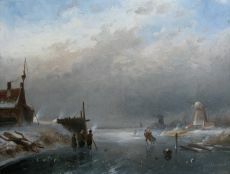 Leickert specialised in winter scenes, sometimes romanticising the sky in pale blues and bright pinks. 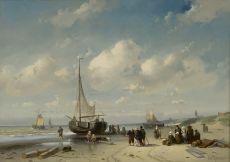 He painted almost all of his works in the Netherlands, in The Hague from 1841–1846 and in Amsterdam from 1849–1883. 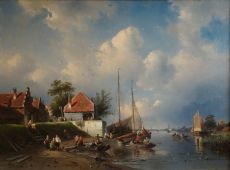 In 1856, he became a member of the Royal Academy of Amsterdam. At the age of 71 he moved to Mainz, Germany, where he died in 1907. 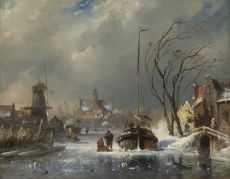 It was Andreas Schelfhout in particular who had a dominant influence on his work. 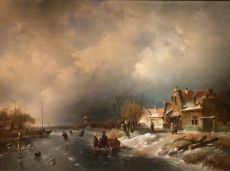 Leickert painted exquisite Dutch ice scenes, summer landscapes and river views in which he incorporated all kinds of motifs from his sketchbooks. 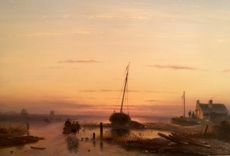 After 1859 he also painted beach scenes and cityscapes. The appeal of his paintings owes much to the splendid play of light and highly narrative detail.